Of all the things that you have seen so far, this one is totally different. In a bizarre moment during a fashion week, three-breasted models were seen walking on the runway. 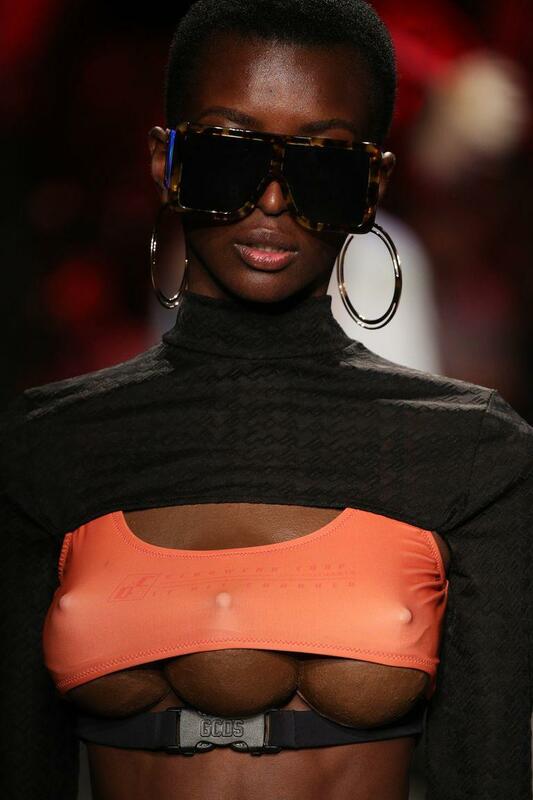 The Italian streetwear brand GCDS sent two models down the catwalk wearing a prosthetic third breast, which you can see clearly their under cropped sports bra tops. The Italian brand GCDS which is stands for God Can’t Destroy Streetwear, sent two models sporting tiny neon bralettes and each had a fake prosthetic breast between their actual breasts. A third breast was implanted in between their other two at the center of their chest. Each model’s top was cropped in manner to reveal a significant amount of underboob that showed off the three breasts lined side-by-side. Social media commenters speculated that the look was inspired by a scene from the 1990 Arnold Schwarzenegger film Total Recall when a similar-looking three-breasted prostitute flashed her chest at the actor’s character. There was also some color inspiration drawn from Pokemon, which explains some of the contrasting brights.